As part of this week’s major feature #ReviewingAMFW, we are taking a trip into the thoughts of those silent beauties that made the runways shine. Enjoy it! 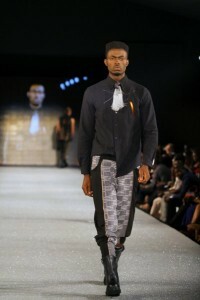 Summarize the AMFW 2012 in one sentence. Do you think models were well represented? How many shows did you walk? All the male designers except two. Which was your favourite and why? Okunore twins – love the vibe from the crowd and their creativity. Give a shout out to your friends and people you met during fashion week. Shout out to Sebastian, Daphine, Dudley, Cosmos, Grace, Aminat, Millien, Uti, Becky, Arieta etc… Misssssss ya’ll. AMFW 2012 was fun and stressful. I did the four days show, in total – 12 designers. I have no favourite ‘cos all the designers where great. Shout to Debbi, Bola, Fatima, love you guys. Models and the Arise team from UK, they were all nice and they made it fun. Well I think models were well represented…we rocked the show. I walk all through Thursday and Sunday. I Walked for 10 designers. Mai Atafo. 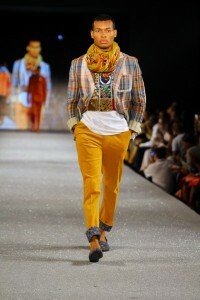 ‘Cos he had a touch of nice anakara fabrics mixed with “English” fabrics – I think that was amazing. Shout out to Dudely, Uti, Sebastian, Toye, Alec Wek, Oluchi, Chinko, Alex, Gbenro, Kelvin, and all the new models….good luck y’all and miss you all…pish…! The energy models & designers from all around the world brought to the runway. Well the models brought their A-game, I just think their handling & welfare can be better. Like I said, it’s a work in progress. Hopefully it gets better. I walked for 3 Designers, MAI, Kola Kuddus, & Okunerun Twins. 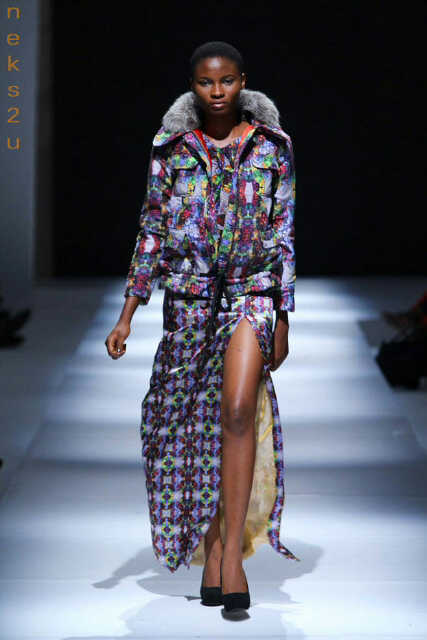 MAI was my favourite, his collection was edgy & colorful. Very fashion forward. Also Kola Kuddus was on point. Very daring. To all the models from all over I met during Fashion week, hope to work with you again, you guys are amazing. It was very nice and fun. I’ll miss all the models both Nigerian and international, because of the way we related. We got to know each other well. Yes I think we were later represented well, after we let them know what we felt and of course they changed towards us in a nice way and they started treating us with respect 🙂 . I modelled for 28 designers all together, both international and local designers. 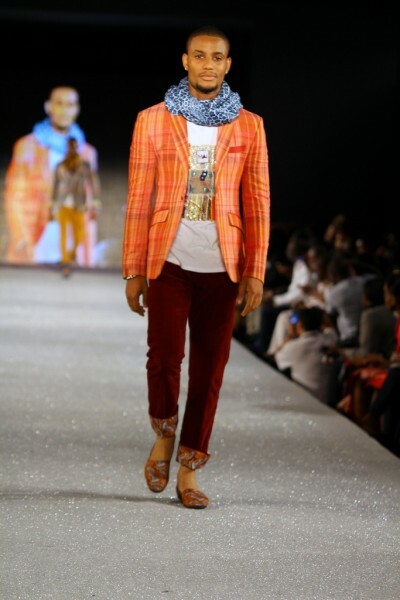 My favourite was Adama Paris because of the Ankara shoes she made. They were very nice and comfortable. 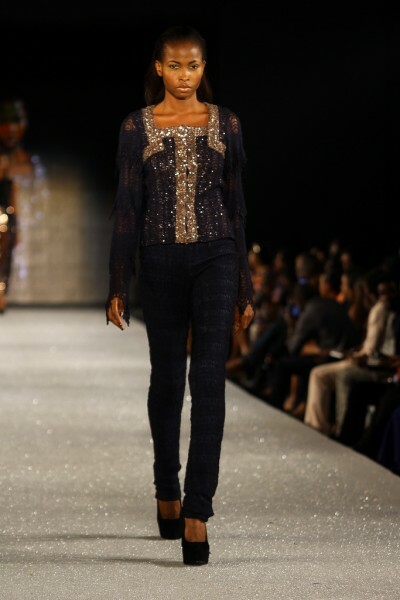 Yemi Olowu is the Fashion Eye HERE!